I am all about the statement ring! I go through phases with jewellery, sometimes I like a very minimal look and sometimes I quite like the Rihanna/Rita Ora look of lots of statement pieces. Apart from my Links of London bracelet, which I never take off, rings are the only jewellery item I usually make the effort to put on every day. I like all sorts of rings, small and understated (like my new Links of London one - which you can see HERE) or big, bold and beautiful! I understand why some people may be put off wearing jewellery that is so bold, but there are so many statement rings for all occasions. I wear mine socially, or even at work! 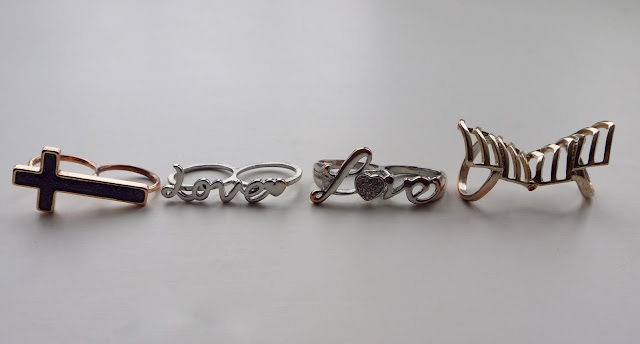 I get quite a lot of my favourite rings from Topshop - they always seem to have what I'm looking for and thy have such a wide range. Not to mention, Topshop jewellery when in the sale is an absolute steal! An all-time favourite for me has to be double-fingered rings; I love the way they look! 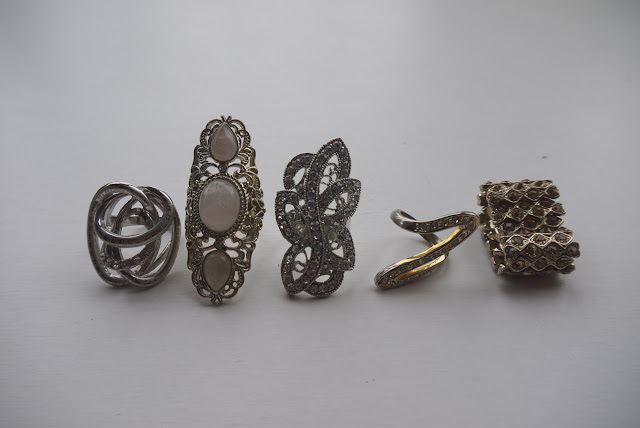 The only annoying thing about statement rings is unless you can afford to buy ones made of expensive materials (I don't know who would even if you could afford them - there's far too many to want! ), you have to be careful that your fingers don't go green! I've only had this trouble with a couple of my really chunky rings, most of them are ok to be honest. Do you like statement rings? And if so, what kind are you're favourite?